ManSound (МенСаунд) is a Ukrainian vocal sextet from Kyiv. They have taken part in numerous jazz festivals around the world, including the prestigious Lionel Hampton Jazz Festival in the United States. In 2001 they were named “Best Vocal Group” by the All-American Entertainment Awards and won first prize at Vokal Total’s international a cappella competition. 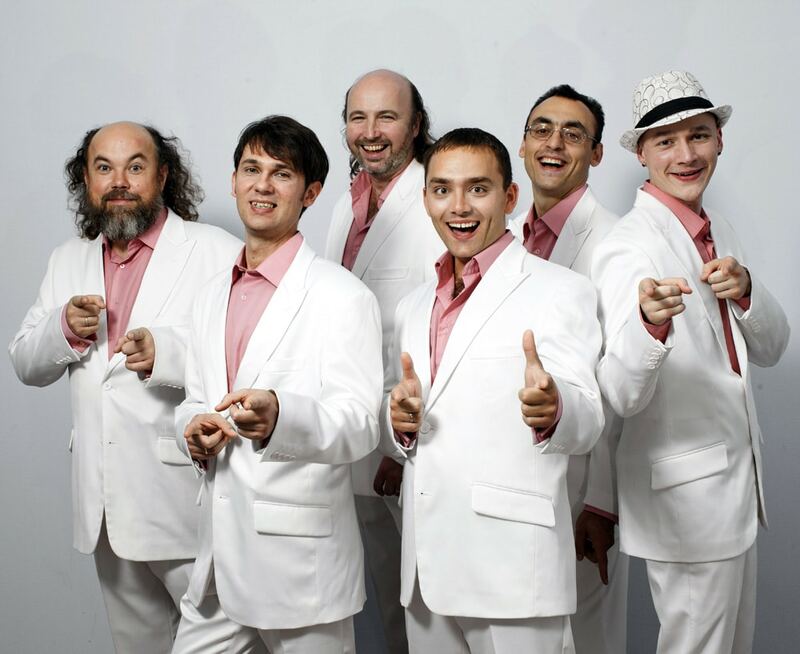 In 2004 the Contemporary A Cappella Society awarded ManSound with “Best Vocal Performance” in the world in the jazz style. Founded in 1994 by accomplished composer and arranger Volodymyr Mikhnovetsky (Володимир Міхновецький), ManSound consists of the tenors Volodymyr Sukhin (Володимир Сухін), Yuriy Romenskiy (Юрій Роменський), Vilen Kilchenko (Вілен Кільченко), and Serhiy Kharchenko (Сергій Харченко), baritone Vyacheslav Rubel (Вячеслав Рубель), and bass Ruben Tolmachev (Рубен Толмачов). Under Mikhnovetsky’s direction until his death in 2004, ManSound rose to international fame and became the leading vocal group in Ukraine and the former Soviet Union. ManSound has taken part in more than 70 music festivals around the world, including in Kamchatka, Hong Kong, the United States, and Europe. All of ManSound’s recordings, both singles and full albums, have been nominated for awards by the Contemporary A Cappella Recording Awards. After Mikhnovetsky’s death in 2004, ManSound organized the first Vocal Zone festival, which is to this day the only a cappella festival in the former Soviet Union. The festival attracts vocalists from all over the world. In 2006 ManSound composed their own jazz version of the Ukrainian national anthem, on the recording for which participated Evgen Filatov (Євген Філатов) and the State Academic Orchestra. The following year, the group performed this piece on Channel One during the opening and closing ceremonies of Ukrainian Independence Day in Kyiv’s main square. In 2011 ManSound was Ukraine’s representative at the 500 Days to Euro 2012 festival in Brussels, Belgium. During the spring of that year, the band gave 15 concerts in Taipei, Taiwan, and two master classes in Hong Kong. Members of ManSound are also in high demand as voice actors in animated films, having worked for the likes of Pixar, Disney, and Unilever. They have also been hired in advertising, performing the Ukrainian version of Coca-Cola’s Christmas ad campaign.